Crab-Ka-Crackle - A Crab Sizzler Festival At NKM Grand is an event that took place between 27-Jun-2006 and 15-Jul-2006 in Hyderabad. 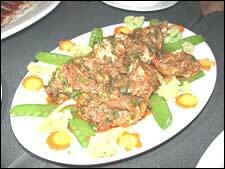 You dont have to go to Andamans to catch some crunchy crabs when NKM Grand has its crab-sizzler fest on. It is pretty toothsome with a choice of Chinese/South Indian/Continental crab preparations and a choice of Noodles/Fried rice/Steamed rice. You also get ambrosial 30ml of red wine as compliments, so don't forget to fight for your rights! All this heavenly spread for an earthly 165 bucks + taxes. Be the first to comment on Crab-Ka-Crackle - A Crab Sizzler Festival At NKM Grand! Just use the simple form below. fullhyd.com has 700,000+ monthly visits. Tell Hyderabad what you feel about Crab-Ka-Crackle - A Crab Sizzler Festival At NKM Grand!